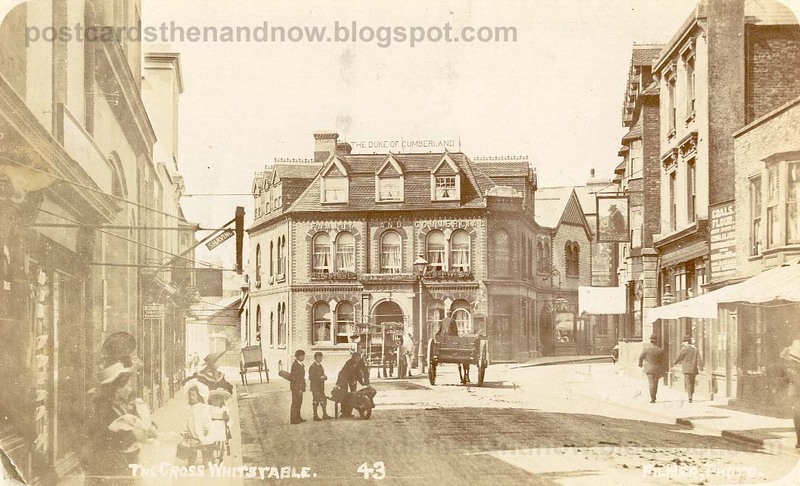 Whitstable, Kent, The Cross c1908. Whitstable is a pretty seaside town in Kent, famous for its oysters. This picture shows the Duke of Cumberland Hotel, still in business. On the right you can see the sign for the wonderfully named Bear and Key Hotel, sadly defunct. There is a very good web page about the Bear and Key at this link, with some evocative photographs. This postcard was published by the excellent postcard publisher Arthur Newell Filmer of Faversham, born in 1855. 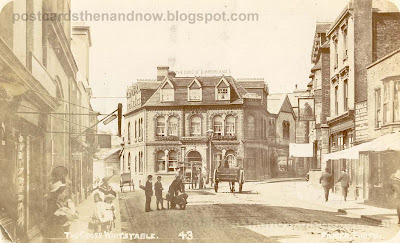 He later moved to Whitstable (after this postcard was published). I have quite a few of his postcards and will be showing more of them on this blog in the future. What would I give to be able to step directly into that old postcard! I guess the current view isn't so bad either. I too would like to step in. I would love to explore the Bear and Key. 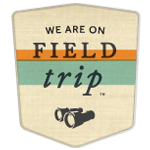 I have a lot of history there and no interior pictures.